takes on the ultimate challenge of condensing all seven HARRY POTTER books (and a real life game of Quidditch) into seventy hilarious minutes. 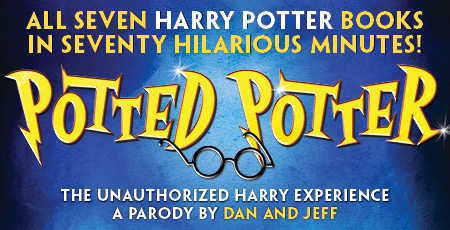 Even if you don't know the difference between a Horcrux and a Hufflepuff, POTTED POTTER will make you roar with laughter. Written and performed by former BBC TV hosts Daniel Clarkson and Jefferson Turner, POTTED POTTER is perfect for ages six to Dumbledore (who is very old indeed). "IT'S THE SINGLE FUNNIEST THING I HAVE SEEN IN AGES. YOU'RE GONNA LOVE THIS SHOW!" WILL TICKLE THE FUNNY BONE OF EVERY AGE GROUP." RESTRICTIONS: Offer subject to availability and may be revoked at anytime. Additional blackout dates may apply. Not valid for previously purchased tickets or in combination with any other offer. All sales final; no refunds or exchanges. Phone orders are subject to service fees. When purchasing tickets at the box office, patron MUST present this printout to the box office. Limit 8 tickets per order.